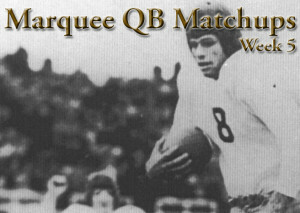 FORT WORTH, Texas (Oct. 2, 2015) – Three games featuring six ranked teams that have combined to open with a 20-1 record have been selected as the Davey O’Brien National Quarterback Award’s Marquee Matchups for the fifth week of the college football season. In the opening game on Saturday, West Virginia’s Skyler Howard and Oklahoma’s Baker Mayfield clash in a Big 12 Conference game featuring two teams averaging better than 40 points per game. Later in prime time, Dak Prescott of Mississippi State and Kyle Allen of Texas A&M face each other in a pivotal SEC West contest. Finally, Notre Dame’s DeShone Kizer and Clemson’s Deshaun Watson take center stage in a battle between two players who pronounce their first names the same. A junior from Fort Worth, Texas, West Virginia’s Skyler Howard currently ranks among the nation’s leaders in passing efficiency (4th, 193.6) and total offense (12th, 334.7). In completing nearly 70 percent of his passes, he has thrown nine touchdowns against just one interception for the 3-0 Mountaineers. In three weeks this season, Baker Mayfield has been named the Davey O’Brien Quarterback of the Week once and has earned honorable mention accolades twice. He ranks among the country’s top five in total offense (400.3) and points responsible for (84) while throwing for 1,062 yards and 10 touchdowns. Dak Prescott, who was a finalist for the Davey O’Brien National Quarterback Award last year, is averaging 297.5 yards of offense per game for 3-1 Mississippi State. The senior has thrown for more than 1,000 yards while tossing multiple touchdown passes in three of the team’s four games against no interceptions this year. Texas A&M’s Kyle Allen is listed among the NCAA leaders in passing touchdowns (6th, 11), points responsible for (7th, 80) and passing efficiency (8th, 179.9). An honorable mention Davey O’Brien Quarterback of the Week selection last week, he has thrown for 952 yards and 11 touchdowns, while adding a pair of rushing scores. DeShone Kizer has taken over the reins of the Notre Dame team after starter Malik Zaire was lost for the year. In his first road game, he fired the game-winning touchdown pass with 12 seconds left to beat Virginia. On the year, he has completed 67.7 percent of his passes for 541 yards and five touchdowns. Deshaun Watson, who owns a 7-1 career record as a starter and appeared on the Davey O’Brien Award’s preseason watch list in 2015, has totaled more than 700 yards of offense in the Tigers’ three games this year. He ranks fourth nationally in completion percentage (.744) and 18th in passing efficiency (165.3).